11.5" x 15" Picture Photo Plaques. 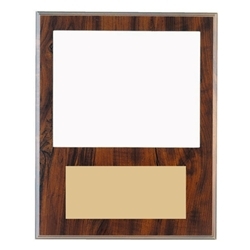 This plaque holds an 8" x 10" picture that you insert yourself upon receipt. Great for a player, a coach or a team parent gift. Photos or certificates simply slide in and there is no need for nails or screws. Acrylic plastic window provides protection and visibility. It's just arrived and looks awesome!! I'm so happy with it, thanks again for getting it here on time.